AMETEK Specialty Metal Products offers a wide range of Thermal Management Products for the electronics industry. These materials offer differing thermal expansion rates that can be engineered to specific I/C materials. 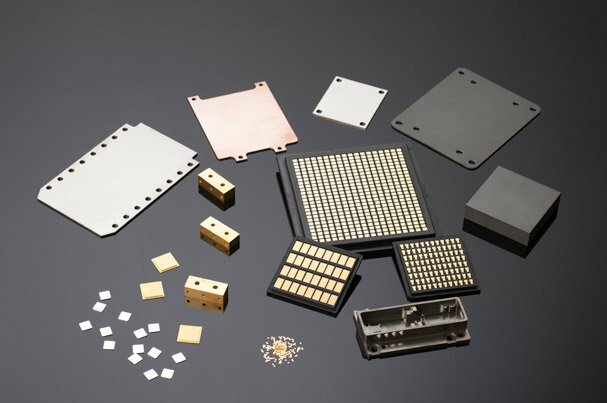 Although these Molybdenum Copper (AMC) and Tungsten Copper (AWC) materials are available in standard chemistry steps of 5% AMETEK is able to offer small volume custom engineered products to allow for very specific rates of expansion. AMETEK is proud to offer Aluminum Silicon Carbide (AlSiC) for application requiring specific expansion rates and low densities such as in aerospace and satellite applications. All of our products are offered as raw material in sheet or block form but we also maintain the capabilities to vertically integrate for turnkey solutions. These include sized pedestals via Electrical Discharge Machining (EDM), high tolerance machining, plating and packaging options such as waffle packs. These materials are used extensively as heat sinks & pedestals for integrated circuits (I/C) as well as the supporting cases for I/C packaging. AMETEK offers these materials in cross-rolled sheet form for excellent x-y expansion properties as well as in pre-machined block form for I/C packaging.